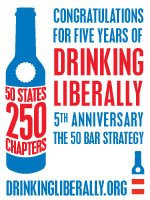 Thank you, hosts and members across the country, for making the 5 Year / 50 State / 250 Chapter goal possible. And thank you Des Moines, Charlotte and Reading, PA for joining us in New York last night (and thanks, Burlington & Los Angeles for calling us while we were celebrating). You all made this network happen -- and people are paying attention. Below is a montage of the congratulation videos: candidates Eric Massa, Mark Begich and Darcy Burner have sent messages along with Howard Dean, Bob Herbert and Sam Seder (compiled by our friend Phil from The Albany Project).